When EMS comes a’ knocking with new music, I am always answering the door. What we have here is a very soulful track from DC Soulplusmind and some excellent DJ skills exhibited by DJ Grazhoppa. Those two things already made this track a gem but then you add the likes of M-Dot, Famoso, and Benefit to the mic duties and you have something superlative. This track is off of the Benefit’s upcoming mixtape, Timing Of the Godfather. 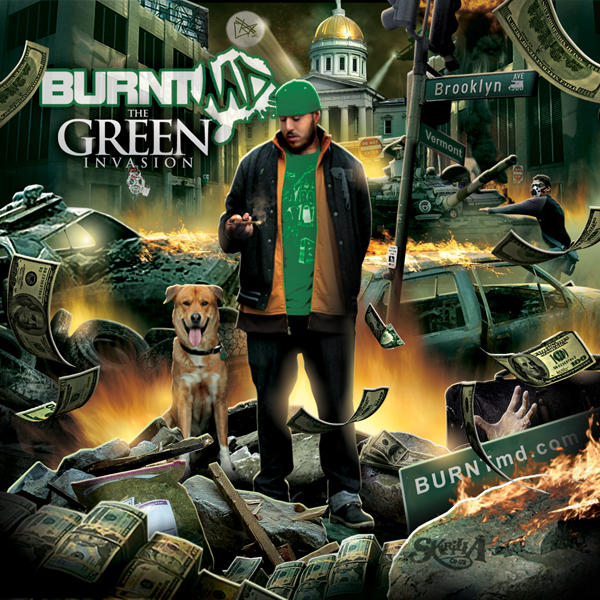 A new joint from BURNTmd’s forthcoming project, The Green Invasion. This is showrt but sweet, backed with production from DJ Grazhoppa. The chopping of samples is on some perfection and our emcee drops some ill sociology with his raspy vocals. Stay tuned Tis project is supposed to drop in December. I am always down for some new music from Chaundon. It’s been a minute. He brings a few guests for this heater. Two of them, Cymarshall Law and M-Dot have been mentioned a couple of times already on HHD. I think you will like this joint…a little verbal murder going on here. Lets face it, we live in a world where people are just not honest with themselves and others. Artists portray themselves often times as something that they are not. It happens everywhere but is extremely prevalent in the music industry. It is especially, true in a convoluted independent music environment when so many people are vying for exposure. In walks, Praverb The Wyse, who with his album, Professional Hobbyist, bucks that trend. We have talked about Praverb before as a member of the collective known as The Brainstormers. What separates him, and makes him noteworthy? Well part of that is just being genuine. He speaks from his own experiences and not that of someone else. The second element that makes him worth talking about is that God given ability. Lets face it, not everybody has a voice to be an emcee. You can’t teach that or coach that. Praverb’s voice and flow command respect and attention. Professional Hobbyist is the culmination of that honesty and talent that everyone will be able to appreciate.